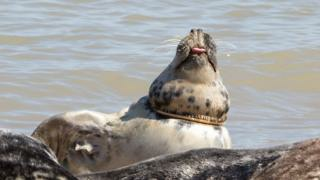 The number of seals with "horrifying" injuries caused by fishing paraphernalia and plastic flying rings is on the rise, a charity has said. The Friends of Horsey Seals monitors the colony in Norfolk and said at least 10 animals currently had nets stuck to them or rings trapped on their necks. Volunteer David Wyse said this year had been "worse than any other". The RSPCA said it had also treated and released six grey seals from Norfolk in 2018, the highest figure for one year. Alison Charles, manager of the RSPCA's East Winch Wildlife Centre, said it had seen between two and four in previous years, and none at all before 2008. "They are inquisitive, so they get caught in nets from fishing trawlers and the single nylon lines used in mackerel fishing, and Frisbees - just all the rubbish that's out there. "I've even seen a seal with a bikini around its neck. As they get larger and larger, it cuts through the skin and they get an infection. "They cannot extend their neck, so they cannot fish." Captured animals are treated with antibiotics over several months and released, but Ms Charles said a young seal had to be put to sleep when a nylon line severed its nose. In 2017, a young adult female survived after a plastic ring cut through several inches of blubber around its neck. "It had cut so deep, when I removed the ring I thought I had decapitated her," said Ms Charles. "I felt sick. It was brilliant when Blue Planet raised the issue of rubbish in our oceans - we had been saying it for years." In May, a grey seal was rescued from Horsey with "horrendous" injuries when it became entangled in discarded plastic netting. It was released in August. Mr Wyse, who works with a team trained by the RSPCA to capture injured seals, said the animals had to be weakened by infection and isolated on the beach before they could be helped. "Another problem is the females are about to give birth and any serious disturbance to the group could result in miscarriages," he said. Last year more than 1,600 seal pups were born on the three-mile (5km) stretch of beach and dunes at Horsey. Both the RSPCA and Friends of Horsey Seals warned that seals should not be approached.